At OSI Digital, we believe that people are at the center of digital transformation. It’s our deep technical and business expertise that allows us to deliver measurable results on digital transformation projects quickly, so our customers can compete in the era of the intelligent enterprise. Plain and simple? We understand our customers’ businesses and the industries they serve. 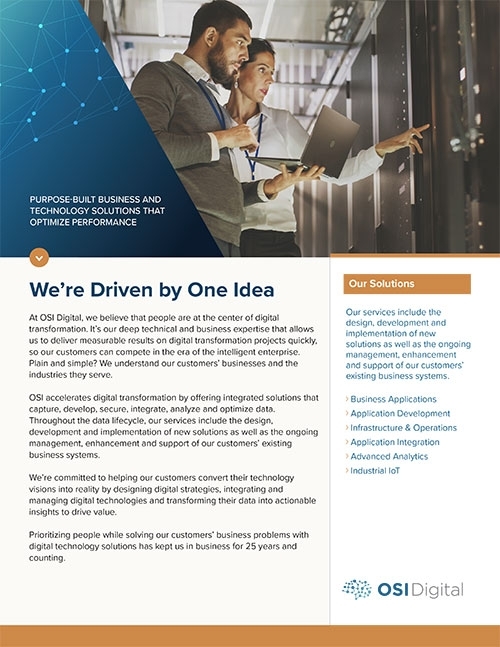 OSI accelerates digital transformation by offering integrated solutions that capture, develop, secure, integrate, analyze and optimize data. Throughout the data lifecycle, our services include the design, development, and implementation of new solutions as well as the ongoing management, enhancement and support of our customers’ existing business systems. We’re committed to helping our customers convert their technology visions into reality by designing digital strategies, integrating and managing digital technologies, and transforming their data into actionable insights to drive value.